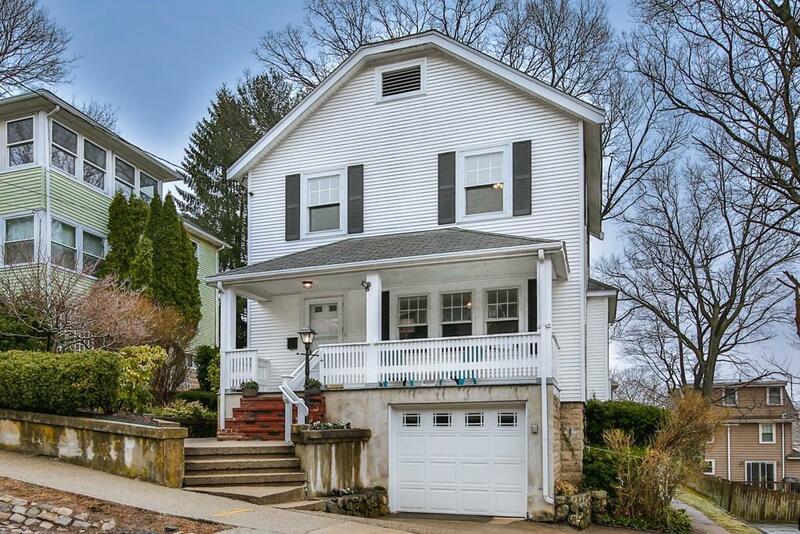 Sunny 1920's colonial has been loved and cared for in the same family for over 50 years! Gumwood moldings and trim throughout the living and dining rooms surround the kitchen, which leads out to the spacious back room. With private outside entrance, fireplace, and newer en-suite half bath with laundry, this space could be used as a first floor master bedroom, private office, or extended stay guest suite. Upstairs has three good sized bedrooms with full bath and pull down attic. Garage parking with two extra side by side driveway spots and full basement with plenty of storage. Rest awhile on the covered front porch or host a summer bbq on your deck overlooking the big FLAT back yard. The location is the perfect spot - easy walk to all the shops and restaurants of the Heights, the Minuteman Bikepath, and the Mass Ave buses to Harvard or Alewife, and so close to the sandy beach of the Arlington Reservoir, skating rink, or Peirce School and playground down the street. Make this your own!